A coach left from Liverpool on the morning of Saturday 4th June 2005 and returned on Monday evening, 6th June. Accommodation was be in the ancient town of Ypres/Ieper in Belgium, a central point on the Western Front of the First World War. The focus of the trip was the activities of the 2/10th (Scottish) Battalion, The King's (Liverpool Regiment), more generally known as the 2nd Battalion The Liverpool Scottish. A cairn with a commemorative plaque was be unveiled near to Liverpool Scottish front line positions south of Bois Grenier and we were entertained by both the Mayor of Erquinghem and the Mayor of Bois Grenier. We were accompanied by Colonel and Mrs Alan Waterworth; Colonel Waterworth is President of the Liverpool Scottish Officers' Association and was then Her Majesty's Lord-Lieutenant for Merseyside. 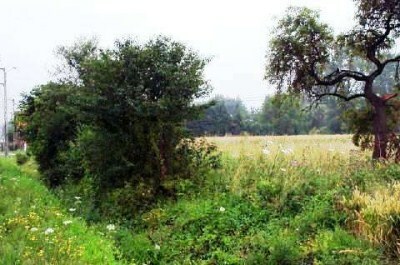 A photo of the site is to the right and the local community intend to landscape it with a minor deviation of the road around the cairn to create a Garden of Peace. This project would not have been possible without the hard work,co-operation and generosity of a number of people. The provision of stone, transport from Liverpool, liaison with the French community and civic authorities and reconnaissance visits to the site had played their part. The 2/10th (Scottish) Bn The King's (Liverpool Regiment) served in France and Flanders from February 1917 until its amalgamation with the 1st Battalion in Spring 1918. 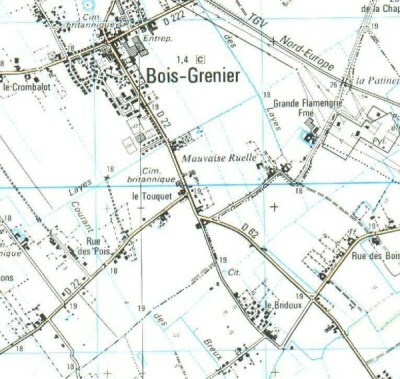 For much of 1917 they served in the Bois Grenier Section near Armentières with their operating base in the small town of Erquinghem - Lys some few kilometers to the west. Although a relatively quiet sector of the front, there are 45 Liverpool Scottish graves in Erquinghem Churchyard Extension Cemetery, maintained by the Commonwealth War Graves Commission. In all there are 680 graves in this churchyard, listed here. 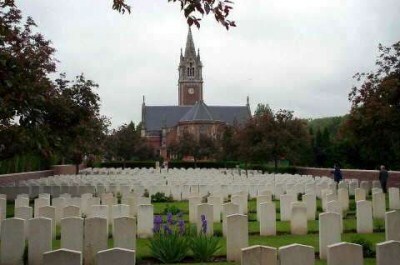 Many of those graves result from the company-sized daylight trench raid known as 'Dicky's Dash', named after Captain Alan Dickinson MC, one of three brother who served with the Liverpool Scottish. 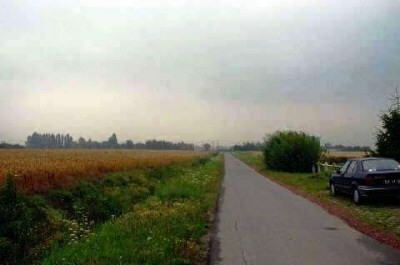 The Dicky's Dash raid took place just south of Bois Grenier on the afternoon of 29th June 1917 along the line of the 'Old Bridoux Road' from a point in the British front line known as the Bridoux Salient. It met with determined resistance from the enemy and although successful in gaining a foothold in the German line, met with heavy casualties in the enemy trenches and on the return to the British frontline. Much research has bee done by Mr. John Dickinson and he was present with members of his family. 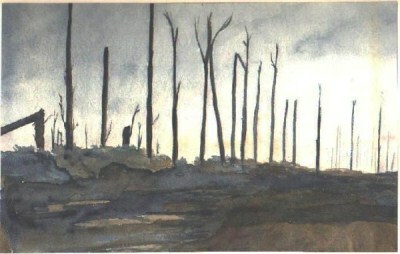 Frank Macdonald, serving in this area with the 2nd Battalion and standing on top of the battalion Headquarters, witnessed the detonation of the mines under Messines Ridge, an explosion reputedly heard in London, and heard the gas bombardment of Armentières, both recorded in his diary. The diary describes how the trenches were built up as breastworks rather than dug down into the earth as a result of the wetness of the land, a feature of the area today. 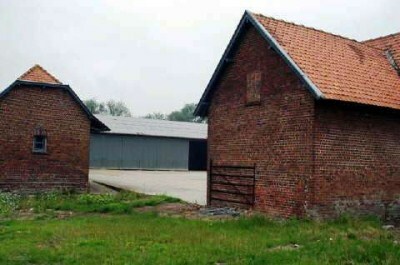 Basil Rathbone, the actor later famous for his film portrayal of Sherlock Holmes, served with the Liverpool Scottish in this area, and is recorded as being billeted at La Rolanderie Farm near to Erquinghem. He later gained an MC as the Patrols Officer with the 1st Battalion elsewhere after the amalgamation of two battalions in early 1918. You can see an outline itinerary here but our vist included. Erquinghem-Lys, a small town near Armentières in France, about 40 minutes away from Ieper. Here we visited the graveyard and attend the opening of M. Jack Thorpe's new museum, Erquinghem et Son Histoire. There was lunch hosted by the Mayor of Erquinghem Lys. Bois Grenier and the old front line near the Bridoux Salient, the scene of the Dicky's Dash Trench Raid of June 1917 (involving C Company and part of A Company of the 2nd Battalion). 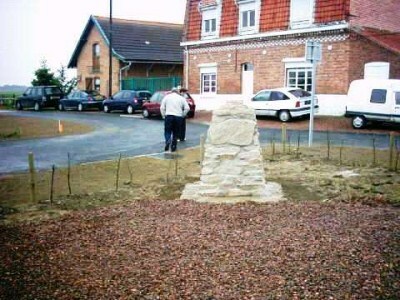 Here we unveiled the memorial cairn and plaque to commemorate the service of the 2nd Battalion in the First World War, took a battlefield walk to follow the course of the Dicky's Dash Trench Raid and marched through Bois Grenier to a Vin d'Honneur hosted by the Mayor of Bois Grenier. 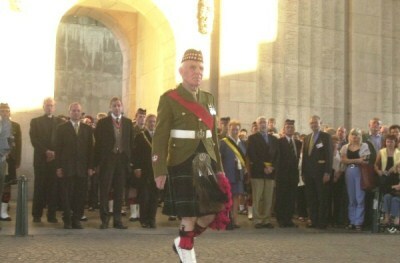 The Menin Gate in Ypres/Ieper for the Last Post Ceremony on Sunday 5th June. It was hoped that we would be able to march to the Menin Gate. 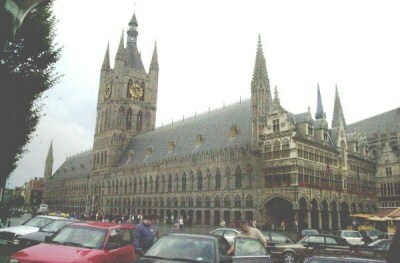 The Menin Gate is the memorial to 55,000 of the men who were missing in the Ypres Salient and who have no known grave. The Last Post Ceremony has taken place there ever night at 8pm since 1927 (apart from the German occupation during WW2) and the Last Post is sounded by buglers from the local Fire Brigade. 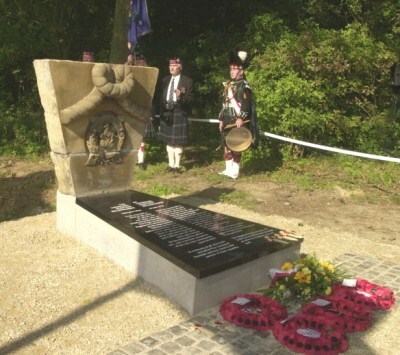 On Monday morning, 6th June, we will visit the Liverpool Scottish Stone at Hooge (Bellewaarde near Ieper/Ypres) which is 3km East of Ieper on the Menin Road (K112). 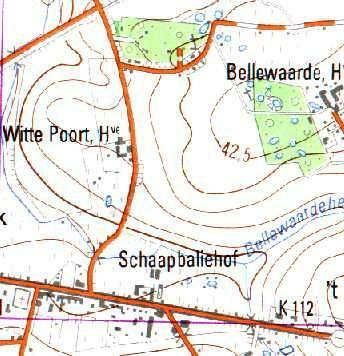 It is located just below the 'double ll' in Bellewaarde on the map to the right. Much fuller details of the Liverpool Scottish Stone can be found here. The Liverpool Scottish cairn is placed at the junction of the D22 and D62 seen on the map (Copyright of the French IGN). This is south of Bois Grenier and about 200m south of the White City CWGC Cemetery. The land as been set aside by the local community as a Garden of Peace. The community intended to landscape this area and introduce a minor deviation to to roadway. This has been completed and the area is under supervision of Jack Thorpe with a trench provided by Mr Bill Washington.